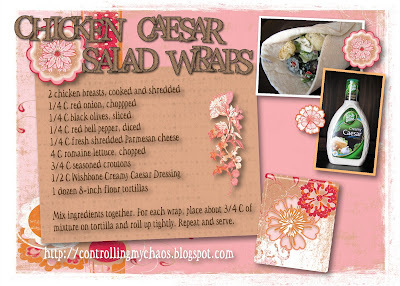 Today I want to share one of my favorite Pampered Chef recipes with you. It's super easy to make and it's perfect for those hot summer days when you don't want to turn on your oven. The wraps are served cold and they're a refreshing dinner on a hot summer's day. These wraps are also a great alternative to the same old sandwich in your lunchbox. This is the short-cut ingredient. It's easy to find and you can make the recipe several times with one bottle. Here's the recipe card. I made this one with the For Her Digital Album Kit from Creative Memories. I think I just might have to try this. I love wraps, especially for lunch at work. Thank you for sharing. ok, not sure if wish-bone is your sponsor or anything..hehe, but I have a suggestion for you. Have you ever tried the Girard's Caesar dressing? It comes in "light" too. Oh.My.Goodness! I don't care for caesar dressing, and I nearly licked my plate!! So tomorrow when I go grocery shopping, I'm going to pick up the ingredients to make this! Because it sounds really good! Girlfriend, I WISH Wish-Bone was my sponsor. You'll have to let me know how the wraps are with your Caesar dressing. YUMMMMY!!! I love the name of your blog by the way!!! I LOVE pampered chef... and I LOVE your recipe card!!! I think that's my next inspiration!!! Sit in the kitchen with the laptop and the scrapbooking program my friend got me for Christmas and organize my recipes! With a slight modification to the dressing and using a whole grain tortilla... this would be a great wrap for my weight loss journey! I'm super excited to give it a try. I even think my kids would eat it. What a wonderful summer meal. You're the best! The recipe card looks great! Thanks for sharing, as always! I'm having so much fun making my recipe cards with the Creative Memories Program that I got from you! Thank you for the inspiration! BTW I love what your doing with your site! It looks great!